Our PVC Polyolefin films are an industry standard general biaxial shrink film with outstanding sparkle gloss. The film has high internal tear resistance and good memory. It offers wrinkle-free shrinkage on high profile and irregular shapes – with good storage characteristics, impact and abrasion resistance. PVC Shrink Wrap- A type of shrink wrap used for a variety of applications. The PVC stands for Polyvinyl chloride. Polyvinyl chloride is the third most produced plastic in the world. PVC shrink wrap was the most commonly used shrink film, until replaced several years ago by polyolefin (POF) shrink wrap. Common Uses of PVC Shrink Wrap- PVC shrink wrap uses include: packaging boxes, CD and DVD packaging, software, small canisters, and other non-edible items. PVC Shrink film is also works very well with automated machines. 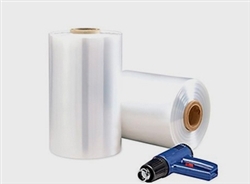 Drawbacks of PVC Shrink Wrap- Sealing Strength, storage issues, and sealing by-products are common drawbacks of PVC Shrink Wrap. The plasticizer in PVC Shrink wrap hardens in cold conditions and softens under hot conditions, therefore compromising the strength of the seal and the plastic. PVC shrink wrap also releases small quantities of hydrogen Chloride into the air and carbon deposits onto the sealer. Proper ventilation is required when sealing PVC shrink wrap.